Ahimsa is the first of the Yamas and each of the other Yamas and Niyamas should be filtered through the lens of Ahimsa. To develop this lens we can ask ourselves three questions prior to making decisions: #1 Will the action be violent towards others? #2 Will the action be violent towards the planet? #3 Will the action be violent towards the self? Mahatma Gandhi said “Ahimsa means not to injure any creature by thought, word or deed. True ahimsa should mean a complete freedom from ill-will and anger and hate and an overflowing of love. 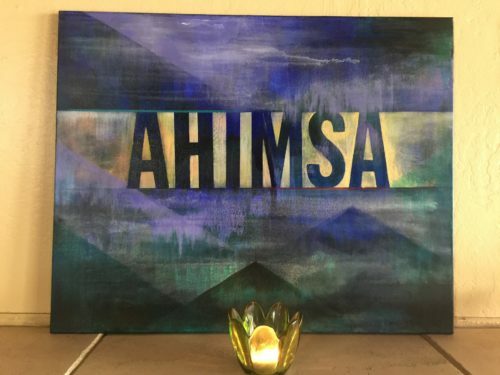 Ahimsa is the attribute of the soul and therefore to be practiced by everybody in all the affairs of life.” This last sentence Gandhi is saying Ahimsa is at the core of who we are. So why all the violence? According to Patanjali it’s due to negative thoughts that are caused by the three poisons: greed, anger and delusion which are byproducts of ignorance. Delusion refers to our wrong view of reality. I think we all suffer from delusions to different degrees throughout our lives. These delusions could be so ingrained either to individuals or to a whole society, they become a paradigm, and we just accept them as “that is just how it is supposed to be”. December 1968, when I was nineteen years old, I got drafted into the Army, and to put it mildly I didn’t like the idea of being drafted at all, but thought that it was my obligation to fulfill my obligation to my country, since my Dad, 6 of my blood Uncles and older brother all served in the military. My Dad was a bomber pilot in World War II, my brother is a Vietnam Vet, so you can see there is a pattern or paradigm that was in motion. 1968 was a very tumultuous time. The whole country was in chaos; Martin Luther King and Robert Kennedy were assassinated, the Vietnam War was in full rage , people were protesting all over the country against the war, protestor were being labeled as cowards and traitors, huge racial riots broke out in major cities across the country. My induction into the Army was delayed but when Friday June the 13th, 1969 came and I was inducted. I was scared, confused, didn’t have a strong conviction one way or the other. I was a kid, 19 years old, I didn’t want to let anyone down and I didn’t want to kill anyone either. I figured I was going to get it over with and make the best of a bad situation. Well, I got through basic training actually with flying colors, they promoted me and I was awarded the outstanding training of my company of 180 soldiers. But during the first or second week of basic training when they were issuing out our rifles one of the trainees refused to take his, his life went from bad to really, really bad. The drill sergeants, lets say they probably didn’t graduate from Stanford, but were very good at breaking someone down and making them a soldier, were in his grill constantly. The humiliation and abuse they inflicted on him could probably be called a form of torture. He didn’t stay around too long, I don’t know what ever became of him. At the time I didn’t realize what a impact he made on me. But He was the shock that I needed to helped me wake up from my delusion, step out of this old paradigm and look deep inside myself about what I was doing. Why do I want go harm someone that is probably in a similar situation as myself, who has very similar aspirations that I have, that was forced into harming me or made to believe he had to, because of powerful people’s greed and anger and the paradigms his society instilled on him. I had these thoughts before going into the Army as well. My fellow trainee just super charged these thoughts. I was really confused, didn’t know what to do. What would the Army do with me if I resisted, since I was already in? The rumor for resistors, was front line Medic. Also, what would my family think? So, after graduating basic training I got to go home for a week on leave, then had to go start Advance Training, for my military job, they wanted me to be an image interpreter, an non combative position, basically I was to pin point bombing targets. I had about two weeks in a detail company before my school started and I was trying to figure out what I was going to do. My new buddy I made in detail co. was scrambling my brain even more, he was wanting me to go AWOL with him to Canada. Well I started my training and on the second day of class my decision erupted from me. I kind of surprised myself, I stood up in the middle of class, the instructor was running a slide projector and I announced “I am not doing this anymore”. Now all eyes on me, the instructor asked what are you not doing?, I said “none of it, I am not going to participate in the Army anymore”, he said in disbelief “are you declaring CO status?” I said “yes”. This was the point of no return. For the next year I was pretty much if limbo, not knowing what the Army was going to do with me, the options were discharge, prison or just keep me in a detail company. During this period of limbo I was doing some reading, trying to find support for my stance, and I came across Leo Tolstoy. 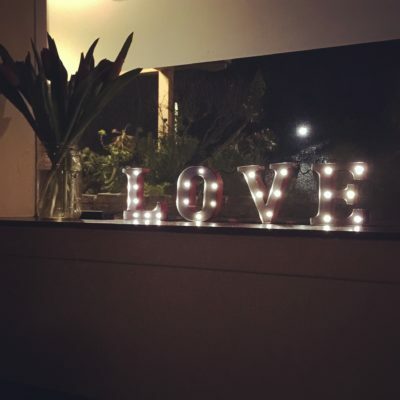 Tolstoy said, The improvement of life was only accomplished to the extent to which it was based on a change of consciousness, that is, to the extent to which the law of violence was replaced in men’s consciousness by the law of love. Those words and other similar words gave me substance and support for my resistance. I had to have interviews with my company commander up to the base commandant for a total of 5 interviews. They went from being pretty intense to almost out of control. At one interview I was told to leave so they wouldn’t do something to me that they would regret. Along with the interviews I got family, friends, teachers, etc. to write letters attesting to my character. All this was put into a file for a decision to be made. Well wouldn’t you know, they lost the file and I had to do the interviews all over again and resubmit my whole file. Finally, I had to take the Army to Federal court and I won the case. Finally they discharged me. The point of all this is, not making any judgements on others, I had to stand up and do what was right for me which I am very proud of. I can’t image being here right now talking about Ahimsa if I hadn’t resisted. I would feel hypocritical standing here knowing I had taken part in the same violent acts that are still happening around the world today and not following what my soul was telling me. I am not so naive to think that a military isn’t necessary in the world we live in today. But, I would like to think that as smart as we are we would be moving away from military and violence, rather making it stronger and more violent than ever. I get upset when I see the military made to look so glamorous to young men and women, keeping them delusional for the need of violence, which often comes from people’s greed. This is so well done! I read this twice and your words are very powerful. Thank you for your understanding of my favorite sanskrit word-ahimsa!